The concept of electrolysis began more than a hundred years ago in Saint Louis Missouri, by Ophthalmologist Charles E. Michel. For many years, he had tried in vain to solve the problem of ingrown eyelashes, which had caused chronic vision problems in several of his patients. never grew back, and history was made. hair-generating tissues. This chemical is so completely caustic that a tiny drop could burn a hole instantly through your skin. According to the NEA (National Electrology Association) this form of hair removal is the only permanent procedure available. Actually, this is not true (many viable studies have shown otherwise): however, it is definitely the most reliable and predictable. Regardless, conventional electrolysis is an outstanding treatment option for the deep traumatization of follicle tissues for the purpose of permanent hair removal. An electrolysis treatment involves the insertion of a sterile probe, the same size as the hair, into the hair follicle opening down to the Dermal Papilla. The dermal papilla is the Electrologist's target. It is the part of the follicle that contains blood and nerves and feeds the growing hair. If the papilla and regenerative cells surrounding it are destroyed, the hair will die. 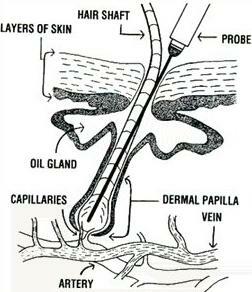 When the probe is in place a low-level electrical current is applied that will destroy the papilla and surrounding cells and loosen the hair in the follicle. The hair is then removed. Puberty, pregnancy, and menopause can also cause excess hair growth. During the normal systemic changes in a woman's life, hormone production varies. It is not uncommon for hormones during these times to be unbalanced. Increased male hormones (androgens) can be present which may result in unwanted hair growth. - Is Electrolysis Permanent? - Electrolysis has been shown to be permanent in over a century of use. Its permanency has been well recognized by physicians and is testified to by hundreds of scientific articles in well respected medical journals and publications. Of course, as with all procedures involving human beings, there will always be instances where 100% permanency is not achieved, but the permanency rate is approximately 93% of all people treated worldwide. - Is Electrolysis Safe? - In the entire over 120 year history of the procedure, the safety and success has been well documented. Today's technicians utilize modern scientific methods of sterilization, disinfection and antisepsis for the equipment they use, and follow guidelines that are laid down by the Centers for Disease Control and professional electrology organizations and societies. - Is Electrolysis Painful? - The treatment sensations have been described in varying ways and depends upon many variables. The most commonly used descriptors are "tingling", "slight heat" and a "stinging" sensation. Well trained technicians make it a priority to work within the comfort level of the patient and will adjust machine settings, probe sizes and length of session to each individual's tolerance level. Never hesitate to tell your technician exactly what you need and can tolerate! - Is Electrolysis Expensive? - When you consider the lifetime costs of shaving creams, razors, tweezers, waxes, depilatories, not to mention all the time and pain involved -- or all the remedies that are expensive yet completely ineffective or even dangerous -- the cost for electrolysis is extremely affordable. Electrolysis is indeed the most cost effective treatment available to get rid of unsightly and embarrassing hair for good! - Is Electrolysis Dangerous? - The amount of electrical current used is extremely small and poses no hazard. Electrolysis is mechanically safe and controlled at every stage of its application. - How Many Treatments? - Electrolysis involves a series of treatments. Many hairs will be eliminated with only one treatment, but some will need two or more treatments to achieve permanency. Electrolysis involves a series of treatments over a period of time. The length of time depends on the amount of hair, its coarseness, the cause of the excess hair, and many other factors, but once the dermal papilla has been eliminated, the hair is dead and will not regrow. shaft, like a hand into a glove. so complete and thorough only one of ten hairs may return to require a second application. Record, October, 1875, 2:145-148). He had been performing electrolysis since 1869.
electrolysis practice, and subsequently, an electrolysis equipment firm. largest suppliers to the electrolysis profession. increased marketing of electrolysis services to the general public. Electrolysis spread from the medical profession to lay electrologists. North America until the late 1970's. 1910, in Germany by Dr. Eitner. blend machine in 1945 and received it in 1948.
information to electrologists throughout the world. 1968 Arthur Hinkel and Richard Lind widely publicized the blend in their text, Electrolysis, Thermolysis and the Blend. Hinkel formalized the concept of intensity x duration = units of lye (treatment energy), which is fundamental to a better understanding of electrolysis. The work of Hinkel and St. Pierre was brilliant, conceptually and technically, and of great assistance to a better scientific understanding of electrolysis. 1970's Electrolysis equipment became much more reliable and simple to use with the development of transistorized equipment. In November, 1979, the Copperwaites of Toronto established International Hair Route, a publication which continues to print articles of interest to all electrologists. 1980's Computerized electrolysis equipment became smaller, more reliable, and easier to use. Mr. Mark Van Orden, of the Fischer Company, was able to incorporate Hinkel's formula into programmable computerized epiltors. The AIDS virus stimulated development of pre-sterilized, disposable needles. In the early 1980's, Drs. Toshio Kobayashi and Shiro Yamada described their technique of high-powered thermolysis, using an insulated needle. 1990's ­ Present Day Standardized training and improved equipment are making electrolysis more popular and more accessible to people around the world. It is still the only method recognized by the FDA as Permanent Hair Removal. Jacque uses state-of-the-art equipment for total control throughout the treatment.